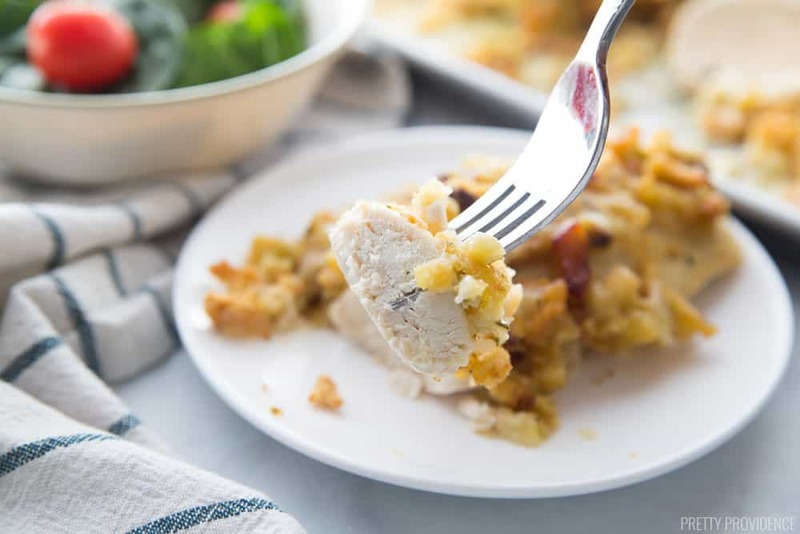 This Chicken and Stuffing Bake is one of our family favorites. It’s the perfect weeknight sheet pan dinner recipe because it is so easy to make! 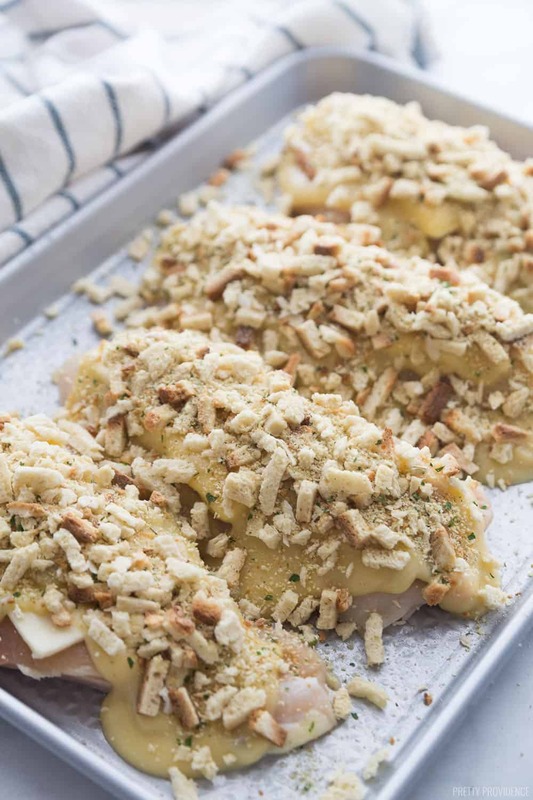 Today, I’m stoked to share this easy and delicious sheet pan dinner – the Chicken and Stuffing Bake! I love weeknight meals that are low on prep and high on flavor, and this is one of our family faves! 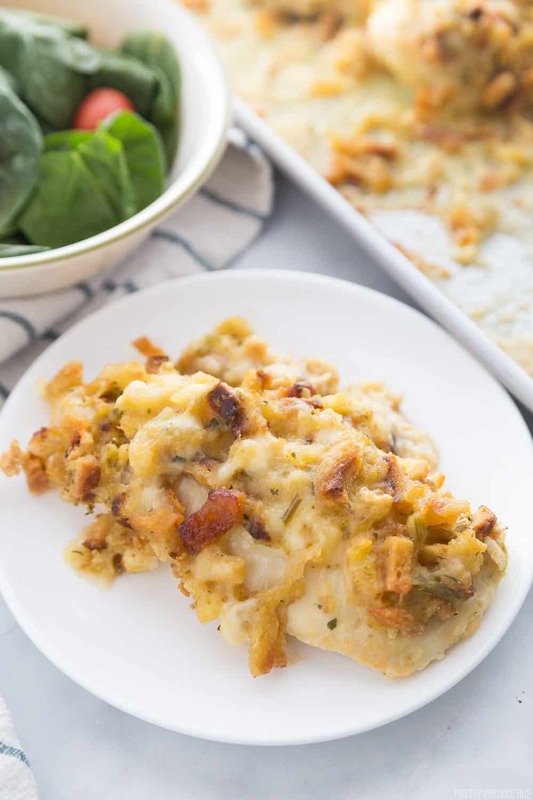 We eat a ton of chicken around here (because, cheap) and I love this dish because it spruces up the chicken breasts so much (we love the Monterrey jack cheese and stuffing mix combination.) You feel like you’re eating something different. Prepare a sheet pan with cooking spray. 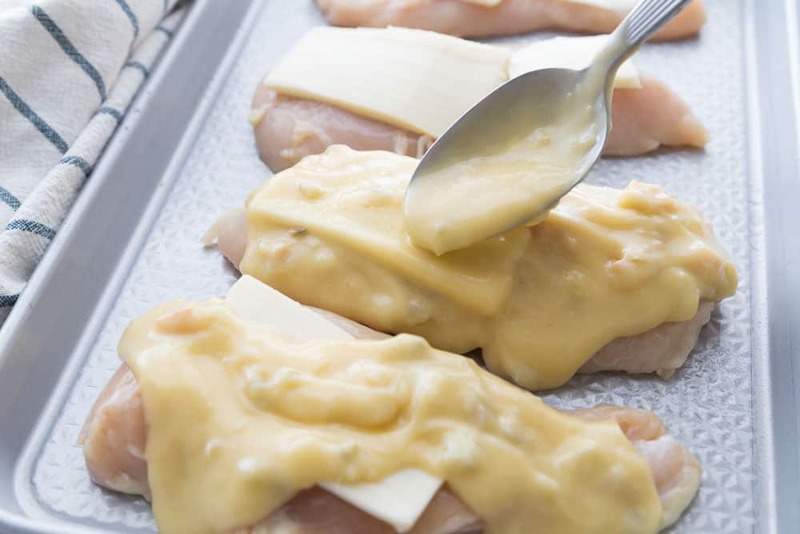 Lay chicken breasts on the sheet and top them with sliced jack cheese. Mix the cream of chicken soup and cream of celery soup, then spoon the mixture onto the chicken breasts. Top the chicken breasts with stuffing mix. Bake at 350° Fahrenheit for 60 minutes or until chicken is cooked through – at least 165° Fahrenheit. Mmmmm! Right out of the oven! What do you serve with this Chicken and Stuffing Bake? Because this meal is pretty hearty, we typically serve it with lighter sides like a green salad, steamed broccoli or green beans! 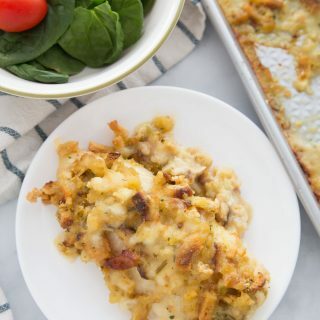 This easy Chicken and Stuffing bake is one of our go-to weeknight dinners. 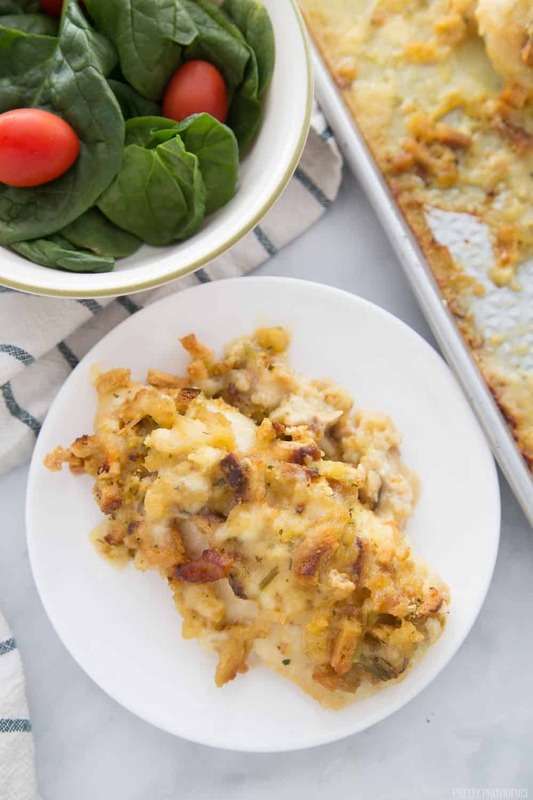 The whole family loves it this easy stove top stuffing casserole! Spray a cookie sheet with pam. 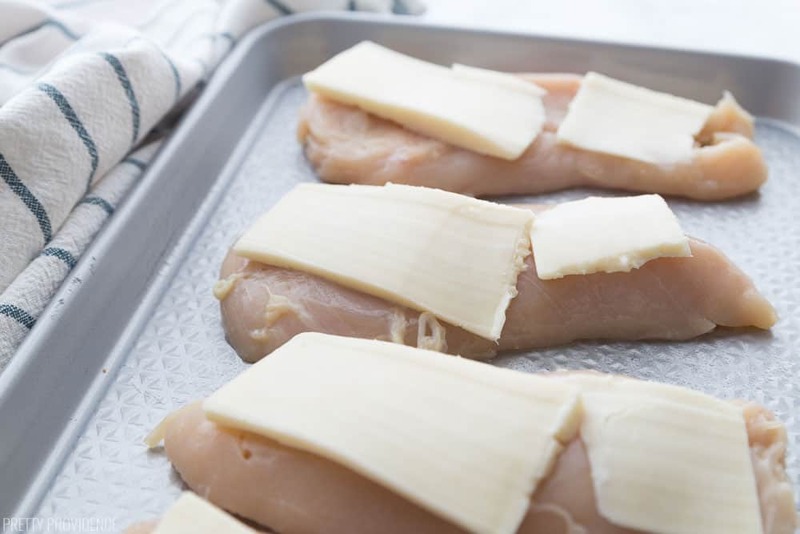 Lay thawed chicken on pan and top with thin slices of cheese. In a bowl mix together both soups and spoon over cheese. Sprinkle with seasoning and then layer the bread on top. Bake at 350 degrees for 60 minutes or until chicken is cooked through. Enjoy this chicken stuffing bake! Another thing I love about this meal is that it reheats like a dream, so if you have leftovers, put them to good use! Happy cooking everybody. Perfect dinner idea! This is going on my must make and try list!!! I am sure it will be a huge hit here. this is a winner winner chicken dinner for sure! I love easy dinner recipes! These look so delicious! Looks so creamy and delicious! I know it’ll be a hit in my house. Meals like this are my favorite! Thanks for sharing! You guys will love it! 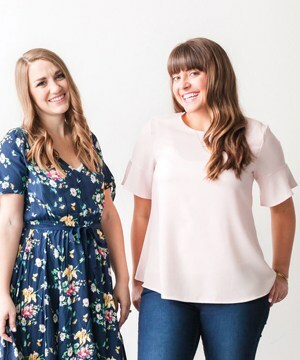 Super easy too!